We managed a 9 hole stableford on Tuesday, this was won by Jean Ray on her return from injury, great result Jean! The RU was Anne Lawrence. Good scores in difficult conditions. I went with some of the Committee to visit the Essex and Herts Air Ambulance base on Monday. We had a very informative visit, which underlined the incredible work this charity does. 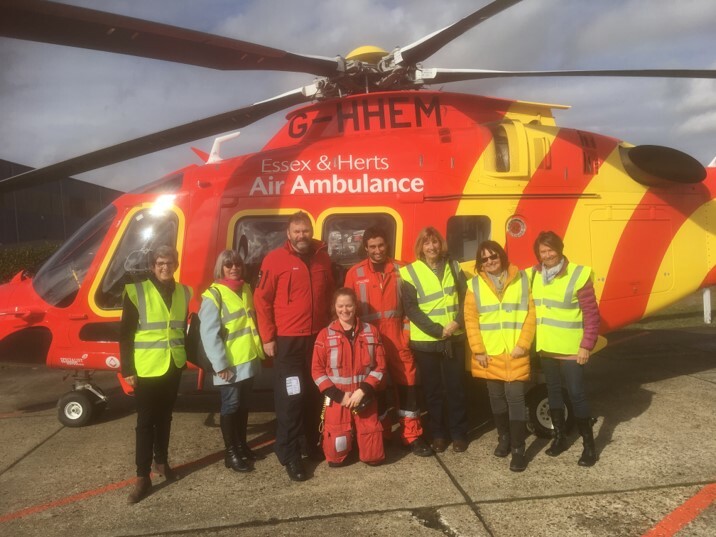 They work in traumatic conditions with very sick or injured people, young or old and having seen it all in operation I feel even more now that this is a terrific cause to raise money for, so let's get our hands in our pockets this year. I know how generous we all are in the Ladies Section. As a specific connection to Chesfield our tour leader, base manager and paramedic (Pictured above at the front) was Lou Rosson who is Lorraine Palmer's niece. You should be very proud of her Lorraine. Deposits of £10 are now due for the Away Day in August...... Please pay by the usual means marking it clearly as Away Day deposit. The O'Sullivan Cup takes place on Thursday this week, this is a team Alliance (best 2 scores to count on each hole) so we will be trying to make up 4 balls wherever possible, giving you all the best possible chance! Good Luck..